Illinois wide receiver Ricky Smalling (4) poses in the endzone after scoring a touchdown during the game against Minnesota at Memorial Stadium on Saturday, Nov. 3. Del’Shawn Phillips thought he had a touchdown — the whole stadium did. When the officials called back his scoop-and-score and whistled Illinois for a sideline interference penalty near the end of the first half against Minnesota, it reduced a 31-14 lead to 24-17 at the half. What could have been a commanding Illini advantage to start the second half was a one-score lead, something that could shift on the back of a single play. For an Illinois team that has struggled all season to put together a complete performance, it felt like it could be the turning point in the game — the point where it all usually falls apart and the Illini let another one get away. Instead, the Illini defense held the Golden Gophers to a chip shot field goal and then forced them into a three-and-out on the opening possession of the second half. 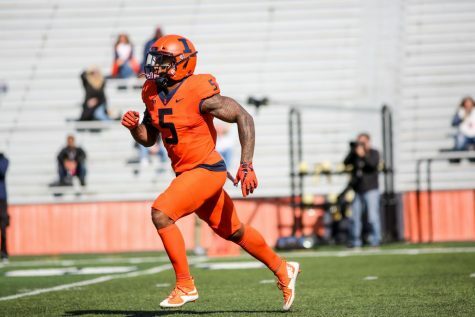 From there, the Illini took over the game, with graduate transfer quarterback AJ Bush leading the offense on a seven-play, 69-yard drive to stretch the lead to 31-17. Sophomore defensive back Tony Adams, who returned from injury and moved to safety to replace injured starter junior Stanley Green, said the defense’s response was indicative of its character. Head coach Lovie Smith thinks his team’s response is a sign of growth. The defense was much better on Saturday. 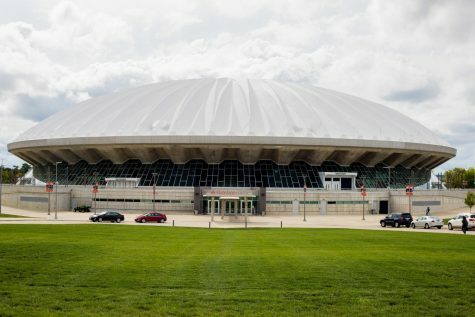 From a simple point of execution, the Illini vastly improved from blowout losses the last three weeks against Purdue, Wisconsin and Maryland. The Illini allowed 438 yards — much more reasonable than the 712 Maryland put up — but were able to stop drives consistently. Minnesota was 6-for-15 on third-down conversions, and freshman quarterback Tanner Morgan was held to 14-for-27, though he did pass for 258 yards and two touchdowns. 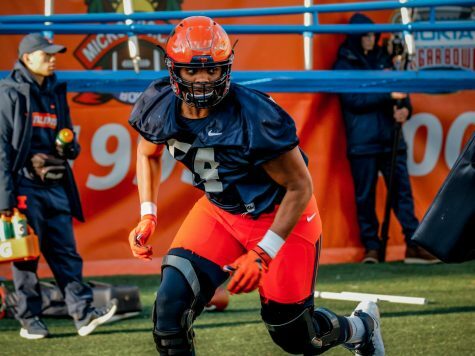 The most notable difference for Illinois was its ability to get pressure on Morgan, who was sacked three times and forced into errant and risky throws throughout the game. 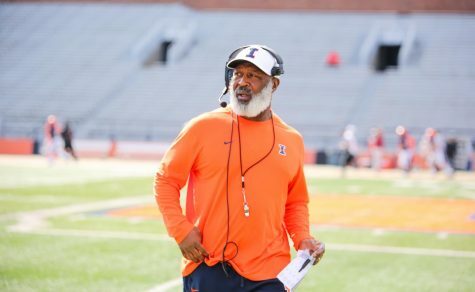 Phillips, the lone senior defensive starter, called Smith’s changes as the defensive play-caller slight, but the Illini executed better as a result. Adams gave a lot of credit to the defensive line for its performance. 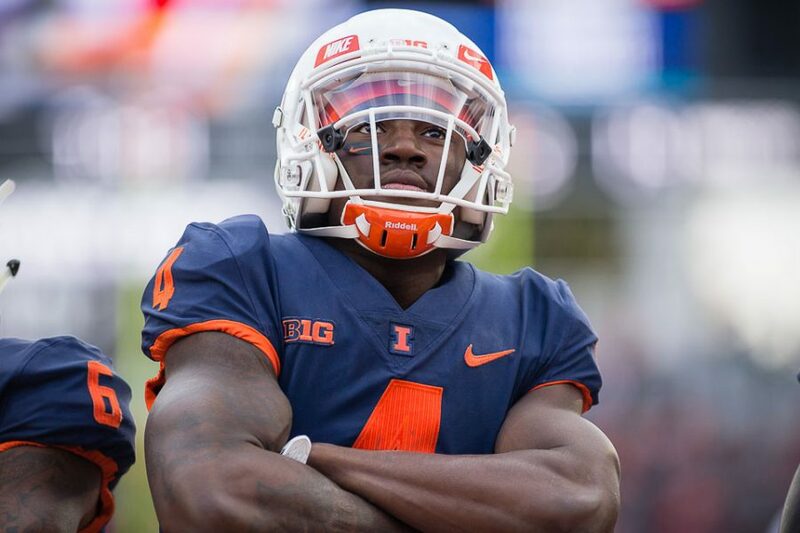 It was key for the unit to step up against the Gophers, especially when the Illini were starting three true freshmen — Jartavius “Quan” Martin, Delano Ware and Sydney Brown — in the secondary. 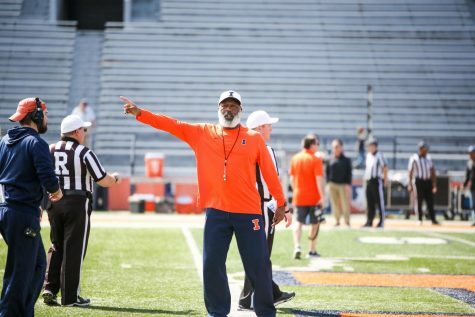 Ahead of this season, Lovie and those around the Illinois program stressed the importance of getting wins on the field to show evidence of improvement in the program. It’s what recruits respond to; most want to be winners. 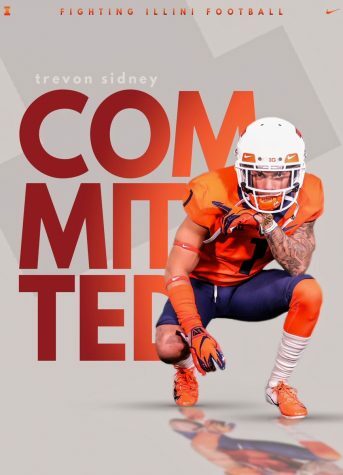 Saturday’s result helps the image of the Illinois program significantly, especially because Minnesota is a major recruiting rival, geographically and as a Big Ten West foe. 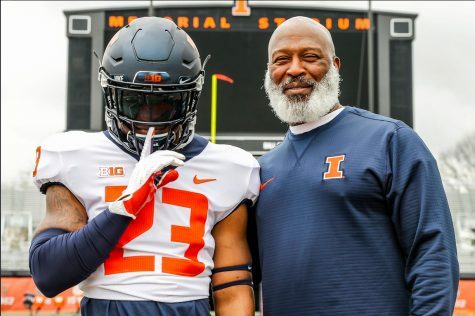 Illinois recruits Isaiah Williams and Marquez Beason were in the crowd on Saturday, and so were big-time targets Shammond Cooper and Mookie Cooper. Rather than seeing the Illini blown out like they were against the Boilermakers, the team put together a complete performance. 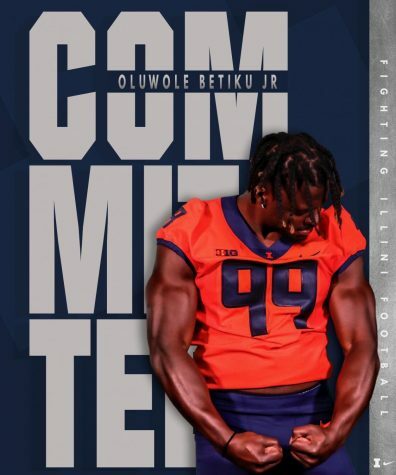 Instead of pitching them on being the missing pieces to a theoretical winning formula, the Illini can show these recruits actual wins that could happen more often if these recruits commit. Lovie knows his program still has a long way to go before bowl games and conference titles, but a home win against a divisional rival is an important step to getting there. Saturday afternoon belonged to first-year offensive coordinator Rod Smith. Smith looked like a mastermind, with his offensive line opening up major holes for Reggie Corbin to have yet another career game. His receivers were also able to get open and hold onto passes from Bush, who did a better job of delivering them on time and on target. Illinois hasn’t put up that many points at Memorial Stadium against a Big Ten opponent since 2008, when it beat Indiana 55-31. Illinois scored 65 in an overtime loss at Michigan in 2010, but the offensive output from Saturday was simply unheard of in the stadium’s recent history. Whether it’s Bush or true freshman M.J. Rivers playing quarterback next week at Nebraska, the offense proved it can execute against Big Ten competition. 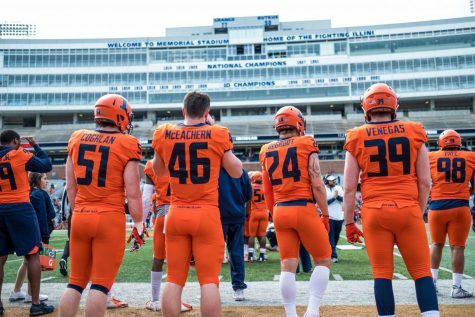 If Mike Epstein is healthy before the end of the season, the Illini could have one of the better rushing offenses around, which will open more of the field for the receivers. But how could it have gotten any worse? Illinois was absolutely torched at Maryland the last time out, giving up 63 points and spurring defensive coordinator Hardy Nickerson to resign. With head coach Lovie Smith calling the shots, the unit looked more together. Schematically, almost nothing changed. The Illini moved around up front and blitzed a bit more, but the results were uncannily different. Three sacks and multiple quarterback hurries helped a young secondary hold up well against a capable Minnesota offense. Illinois held Minnesota to 4.2 yards per carry (178 rushing yards) and to a respectable 260 receiving yards. The unit came up with some big stops when the game depended on it. 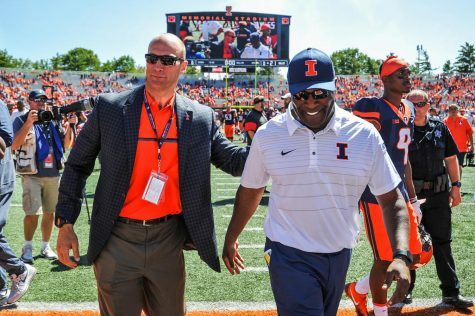 If they can do that against Nebraska, the Illini have a legitimate shot at their third road win in the Big Ten under Lovie. This was AJ Bush’s best game as an Illini. No, he wasn’t perfect, but he was reliable, connecting on 18-of-25 passes for 216 yards and two touchdowns. He had an ugly interception, throwing while on the run into a swarm of bodies, but he looks to have a good rhythm going with Champaign Centennial High School alumnus Dominic Stampley, who had eight receptions for 65 yards. Maybe even more encouraging for Illinois, Bush linked up with sophomore Ricky Smalling four times — once for a 67-yard touchdown — for 86 total yards. To add to the Illini’s already sweet day on the ground, Bush totaled 127 rushing yards on 14 carries. He scored two touchdowns rushing, including a 3-yard run on the same drive that he broke one off for 44 yards. His throwing motion still leaves a lot to be desired, but Bush moved the offense consistently — through his legs when he needed and through the air with help from his receivers.